I am going to start out by saying, I could do with a serious purge of stuff. That said, I have so much because I've flitted from scrapbooking to 3D creations (birdhouses) to fabric creations to painting on canvas to art journaling. 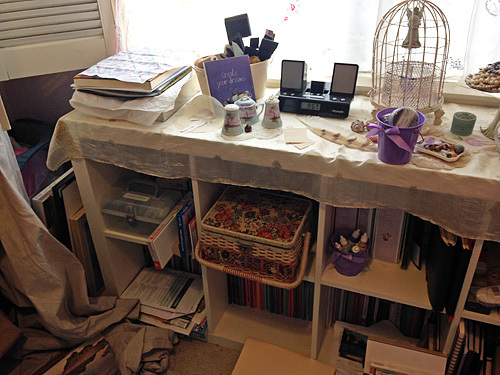 Above: The white Shabby Chic bookcase is filled to the brim. 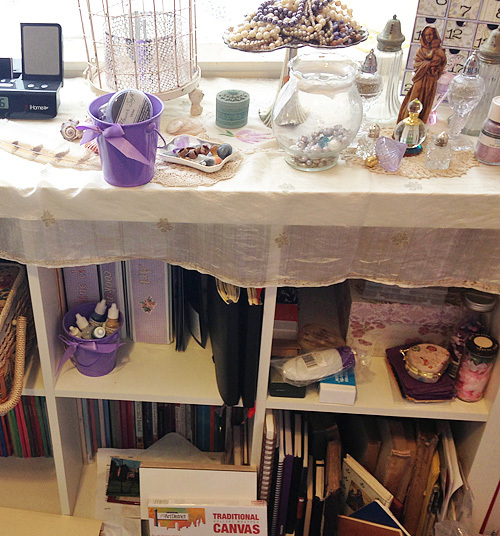 Top shelf: pretties (china cup, piano player rolls, old photos, baby booties, etc). 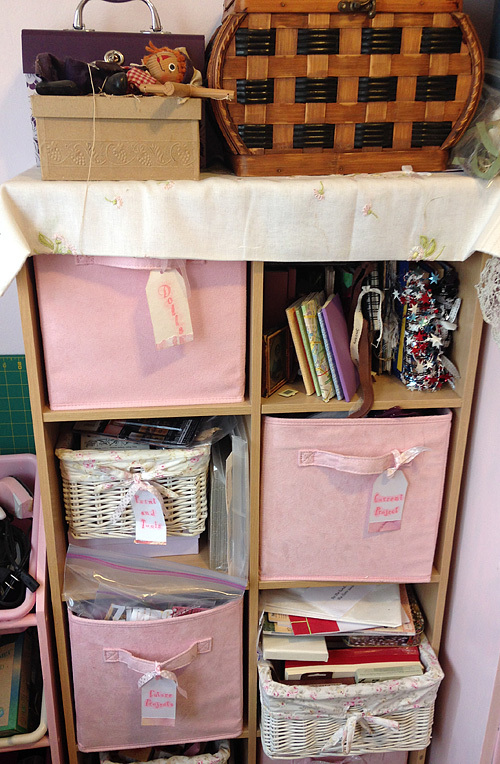 Second shelf: another canvas from a Suzi Blu class; hankies and buttons and other doo-dads are stored here, plus another pretty collaged canvas to hide some of the clutter. Third Shelf: Scrapbooks mostly. Bottom shelf: paper. This is all the commercial paper I have (this doesn't include the vintage stuff). As you can see I am really good about putting away. Not. Above: The closet space: You can still see hints of the papered wall before I put in another set of shelves (they're for shoes, technically) to hold: (top shelf) bookmaking supplies, art journals, sparkling H2O paints, stencils and my mother-in-law's hair in braids from when she was a girl. Yeah, you read that right. Don't know why I claimed them, but a use will come to me. I hope. 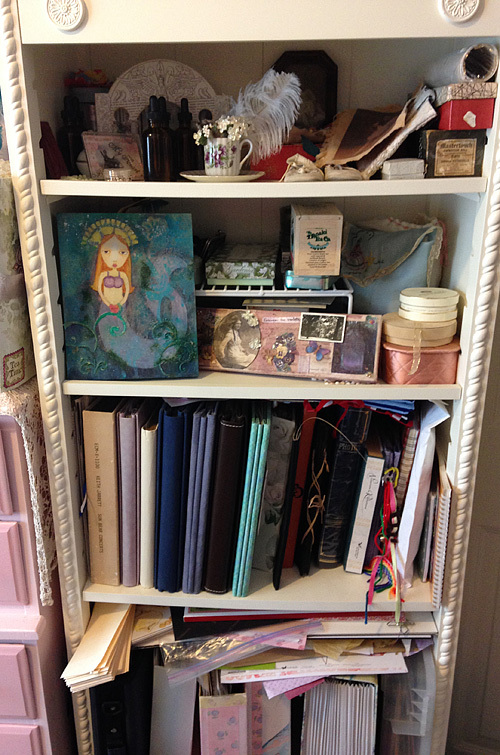 The rest holds my childhood diaries, vintage photo albums and various Golden mediums. The visible glass top there is supposed to be pretty. But it needs a clean up. 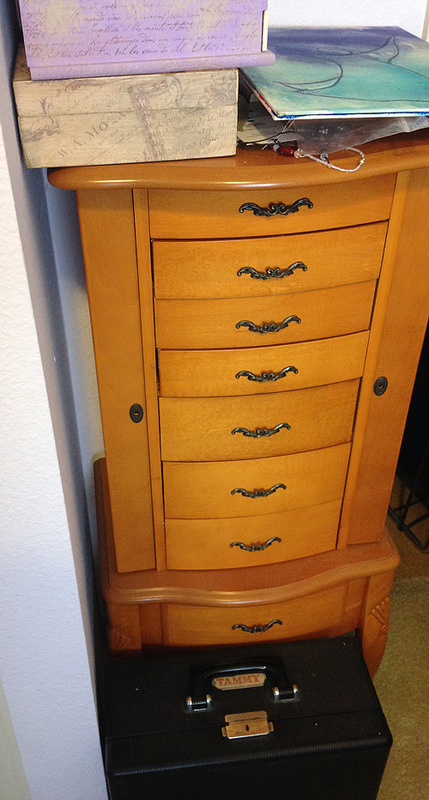 The chest of drawers contain old tablecloths (see the green tank? One of my unfinished projects is to cover it with doilies and make a lace top), fabric for a quilting project and so on. Above: The very top of the closet. 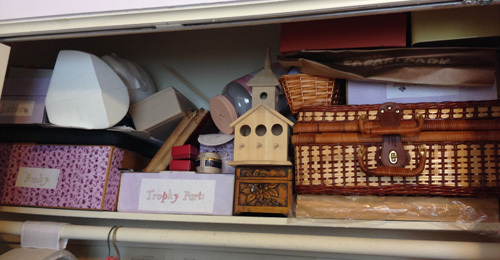 It has a box of my Psanky supplies (that I haven't touched in an age despite my best intentions), trophy parts that I rescued from a church cleanout, other containers, a styrofoam bust and a picnic basket that is actually for picnics. Above: one of my art works in progress. I have fallen for writing icons. I do them in acrylic which is a modern take on the encaustics or egg tempera techniques. Above: one of my newer purchases, one of those IKEA rolling carts. And in teal which is my new favorite color. 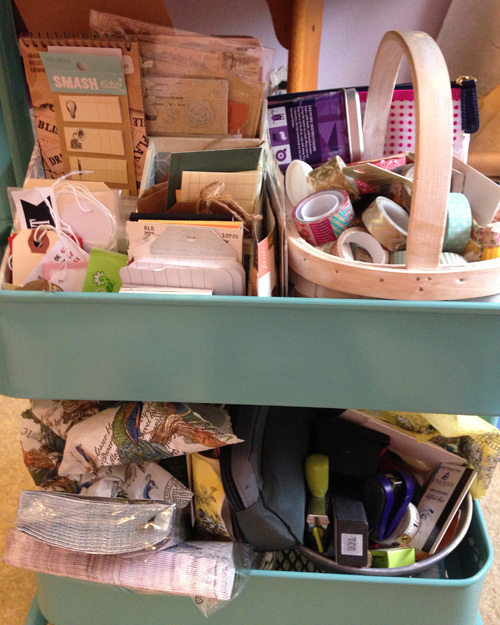 It's pulled right by my table for easy reach of paints, washi tape and journaling bitses. A view from above: my most commonly used supplies (not including washi tape which didn't fit): Golden fluid acrylics and a couple of tubes of heavy-body acrylics, a few Dylusion spray inks, prismacolor pencils, inktense pencils, there's an empty tin where my NeoColor II watercolor crayons go because I just got back from a trip and haven't put them back yet, inks, pens, watercolor pencils. Above: I have a lot of paper napkins for collaging. Send help. Above: the jewelry cabinet stores markers, paperclips, doo-dads, and so on. As I was having a look I found an unopened package of white gel pens! Truly a treasure chest. And that's a vintage typewriter in its black case. Above: I have a pink chest of drawers which holds photos, glue dots and other adhesives, ink pads, glitter, and some fabric. 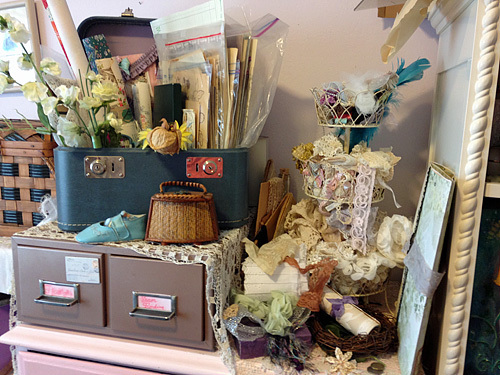 On top of that is the small metal card cabinet which holds fabric flowers, ribbon and lace, the blue suitcase holds vintagey papers and some fake flowers and as you can see there is more lace. Above: small travel and art journals, tools, gold leaf, cards and envelopes, a future projects box and a current projects box that have been ignored for so long ... stamps, jewelry making supplies. 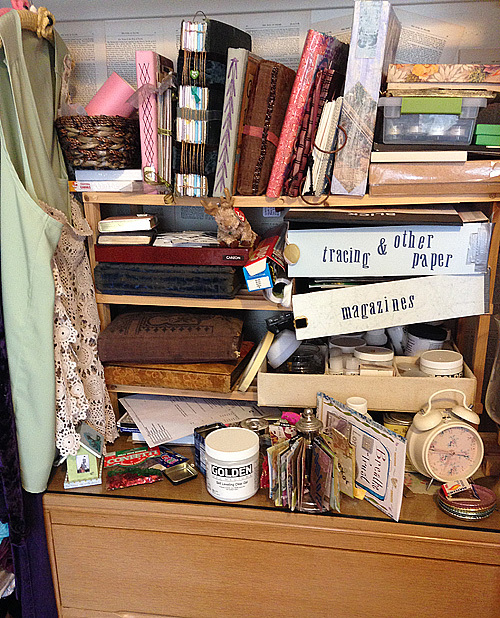 Above: It contains large stencils, an insane number of Stampinton publications, the sewing basket I've had since I was a little girl (with some unfinished projects dating from the same, music, collaging supplies, books to alter, and so on and so forth. OK, folks now it's time to Get Real. Below is a portion of the floor and is pretty true of the rest of the floor, alas. The beige book propped up in the middle is my latest art journal and it is huge! The biggest I've worked in. Off to the left of that is the box that holds my Life Book 2015 pages. (You can still sign up for this year long class -- the videos and pdfs are all downloadable!) 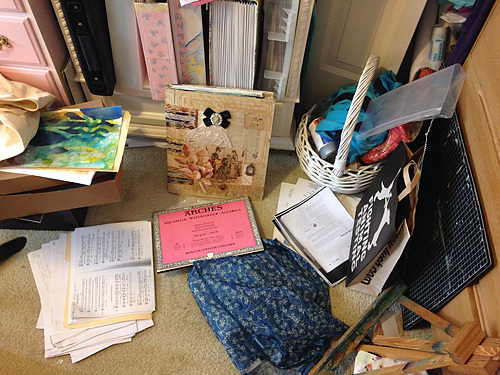 There's also some music to be put away, a bag full of invitations that I plan to pull apart for the paper and some more stuff that just needs to be put away. You know how it goes. Below is my "for real" art table. It has two in progress Life Book journal pages on it (from two different classes.) 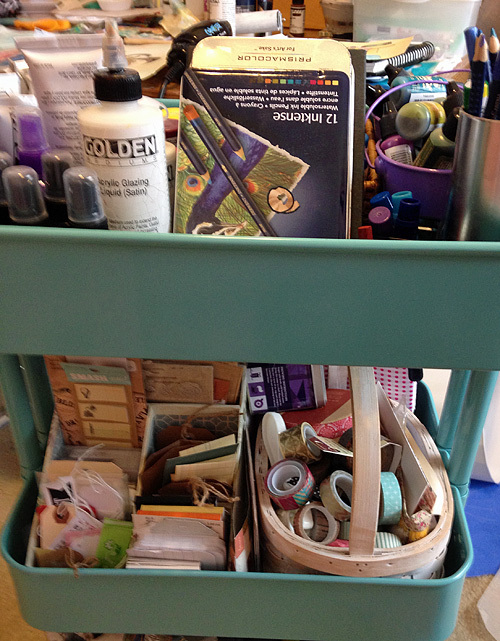 On the left is my traveling art journal kit, opened but not yet unpacked. New is an Ott-Lite because I found that the light in this room wasn't bright enough for the fine detail of icon painting. 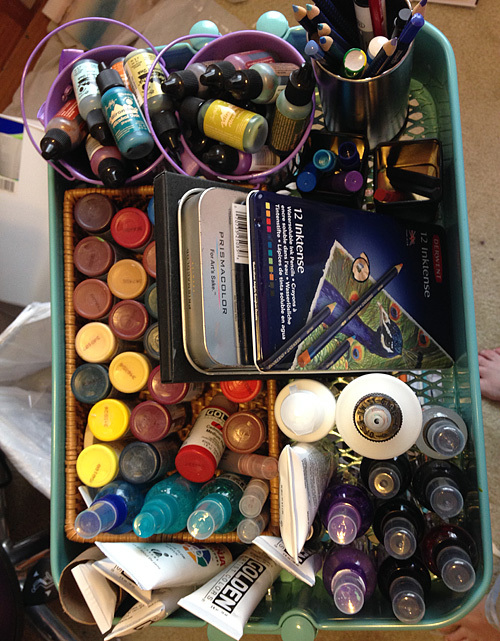 There's more paint, liquid watercolors, inks and glimmer mists at the back. Brushes, palette knives, etc, are in a rotating bucket on the right. And so on. I've lost my small pink scissors and honestly, it's no surprise. So there we have it! This is where this particular blogger creates! I am looking forward to seeing your spaces. Thanks for taking the time to have a look. Great space Leanne. 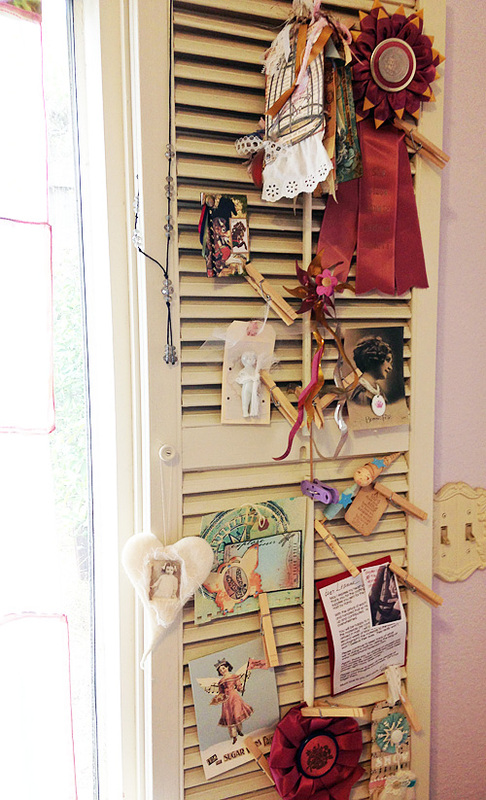 I love your display shutter idea. And loving your art pieces. Thanks for stopping by for a visit. Have a beautiful day. Hi Leanne, what a talent you are and so many treasures to inspire your creative time. Love your display shutter and the colors in your space. Thank you for stopping by and your kind comment. Have a fun time visiting. What a fun space, Leanne! I, too, am one of those "flitterers,'' going from one craft to another & back again. I just want to try everything at least once! I have that cute little Raskog cart, too. I wasn't even sure how I was going to use it, but it was just so doggone cute, I couldn't resist it. I love it for my Project Life supplies. 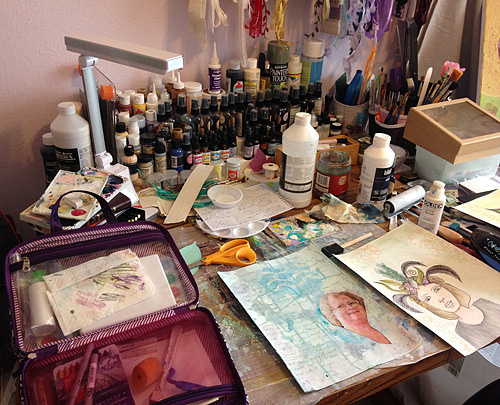 Thanks for sharing your creative space. Thank you for visiting my space and leaving a sweet comment! Carol -- thanks for returning the visit! I know what you mean about collecting a lot (I too have to get some help, lol). That Ikea cart that holds all your supplies is super, got one my self but didn't get it in that teal colour that I wanted. But still works like a charm. yes, nothing else in my room is teal … but I still had to get it! It’s taken me a little while to figure out how to best use it. so far so good. Thank you for visiting my studio and for your nice comments. I really like your shutter idea. I just might need to add one to my studio. Thanks for the look 'round! Ok, you totally have me intrigued with egg tempera techniques now. I had not heard of it until this post. I'm going to give it a try for sure. Love your old typewriter case. I love that look! Your space is great. I just commented to another blogger that I wondered how many of us who linked to the party have the aqua IKEA cart. Nice! I'm just having so much fun seeing into every ones spaces!!! Thanks for sharing!!! You have a great space for doing your creative things! Loved my visit! 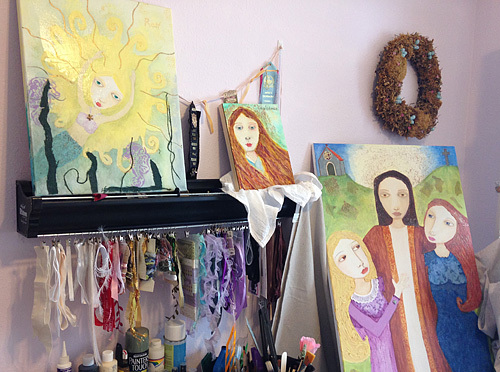 Leanne, thank you so much for joining the party and showing off your creative space! Never apologize for having too mush stuff. It's all very necessary to our creative spirit!!! Hope you are having fun and making lots of new friends!! I realize I'm late visiting, but I couldn't miss this opportunity to see your "for real" and creative space. I have to put things back after each time I use it, or my space would be a lot more "real" than yours. You make lovely art, and that is what counts. Thanks for sharing your incredible craft space with us. Hello and thank you for visiting my blog and leaving such kind comments! You do some very lovely paintings, and I especially envy that you are writing icons--something I want to learn someday. I enjoyed last year's post "for real". It's fun to see workspaces in use! Hi Leanne, I enjoyed your space. I love that you keep markers in the jewelry cabinet. What a great repurpose! 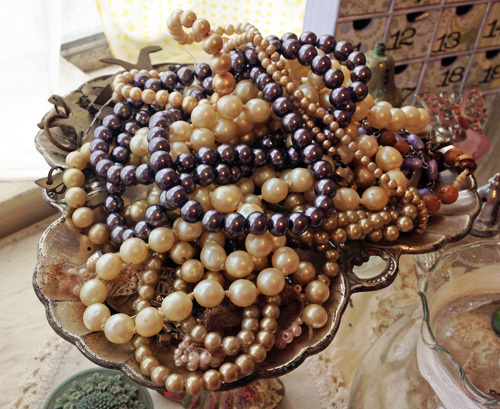 Thank you for stopping by my wbc blog post. You asked for more pictures of how I fit into a small space. I've added more in a 2nd post.